As a native New Yorker born to musician parents, Gelman began performing at open mic nights in clubs like CBGB and The Bitter End when she was only 17, but it was the subway that really influenced her music style, allowing her to sing for a wider variety of listeners. After a few attempts at “busking” (as street performing is called) nine years ago, a friend encouraged Natalie to start playing guitar and singing in the subway for money. It was here she realized the influence not only she can have as a performer, but subway performing can have on her. As a member of Music Under New York, or MUNY, Natalie now has a schedule of where to perform, her MUNY permit affording her protection from harassment by police officers for starting crowds. MUNY was initiated by the Mass Transit Authority in 1987 to promote the music culture by “presenting quality music to the commuting public” according to its website. With over 100 musical acts performing music of various genres, from folk to opera to blues, the popular program is positively changing our commutes. Just ask Cathy Grier, or NYC Subway Girl, a MUNY member since 1999. Despite having performed her “folked-up blues” music everywhere from bars in Key West, Florida, to across Germany as a member of a touring French girl band, Grier is most inspired by subway performing, favoring three spots within Grand Central (each location has different acoustics and atmosphere, so she “changes rhythms and tempos accordingly”). She is even recording an album of songs about the subway in the subway. Tom Swafford, a classically trained composer and arranger with a PhD in composing from UC Berkeley, also recorded an album about performing in the subway called 7th Avenue. At first, he did not even realize he was improvising the same songs repeatedly, but when he did, he decided to make an album. Although Gelman, Grier and Swafford have had very different performance experiences, all describe the subway as one of their favorite venues due to the inherent spontaneity of busking underground. This is a sentiment shared by all subway musicians; regardless of what type of music they are playing, it is about how that music makes the listeners feel that matters. Across the board, the goal is to put a smile on the face of just one person. It is not a requirement to be a MUNY member to perform in the subway, however. Plenty of musicians perform without a permit due to a variety of reasons, including the competitiveness of becoming a MUNY member. This is what makes playing in the New York City subway the ultimate performance: you do not need a permit, contract, producer, album, or big name. You need your voice, perhaps a musical instrument, and that is it. Commuters can come and go, but that experience of performing will last forever. You were there and sang a song, and even if only with a smile, you changed someone. Hi, all. I hope we spend some time on Tuesday talking about the coverage of the reported death of bin Laden. Interesting, indeed. “star” stars are though for the piece – I need better quotes. So far, I don’t have any stand-out interviews, but I do have a lot of background information on what subway performing is like. It’s coming together, but slowly. I want to get some high quality videos to include in the final blog post (I do have one so far, but the acoustics are a bit off). Lastly, I put a call into two of the Arts for Transit authorized (and publicized) musician groups. I think it will all come together. Ok I don’t know why, but the “links” feature is not working for me right now. I keep trying to link to all of the various websites I have used for my research so far, but it won’t let me. Basically, I got the idea to write about the subway performance artists (most of whom are musicians) through a NY Magazine article from February 27. Then, I read various online articles about the musicians, including the March 21 blog post from the NY Times (about the changing face of subway musicians), a April 19 NY Daily News article about Lyle Divinksy (a singer/guitarist), and additional NY Magazine articles about different performers (one about Susan Cagle, who has now sold 30,000 copies of her album because of her subway performing). Additionally, I researched the various laws associated with performing, especially in regard to MTA – Arts for Transit and MUNY. 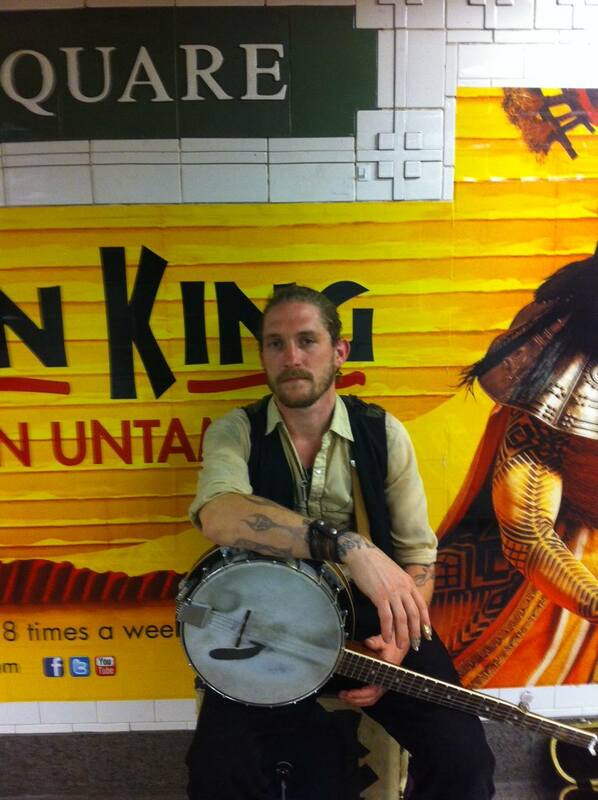 In the past week I have checked out musicians at Lorimer, Union Square, Battery Park and Bed-Stuy stations. In my research, I have noticed a couple of (random) things that might pose problems/become more interesting. A) It is going to be hard to find new ways of saying “performer” throughout the piece without being contrived. B) Many of the laws contradict one another, or at least the resultant discrepancies between law enforcement and musicians contradict the actual laws. C) People actually can and do get arrested…for singing too loud? Shameful. D) Some people have actually garnered moderate fame from this. E) MUNY is actually very selective, but also a permit is NOT necessary to perform down below the city.